Ken S. Coates and William R. Morrison — Land of the Midnight Sun. A History of the Yukon. Kathleen E. McCrone — Sport and the Physical Emancipation of English Women, 1870-1914. Peter Brown — The Body and Society: Men, Women, and Sexual Renunciation in Early Christianity. Altina L. Waller — Feud: Hatfields, McCoys, and Social Change in Appalachia, 1860-1900. Richard Jules Oestreicher — Solidarity and Fragmentation: Working People and Class Consciousness in Detroit, 1875-1900. Jennifer S.H. Brown and Robert Brightman — "The Order of the Dreamed": George Nelson on Cree and Northern Ojibwa Religion and Myth, 1823. Angus McLaren and Arlene Tigar McLaren — The Bedroom and the State: The Changing Practices and Politics of Contraception and Abortion in Canada, 1880-1980. Hilton L. Root — Peasants and King in Burgundy: Agrarian Foundations of French Absolutism. Ruth Mazo Karras — Slavery and Society in Medieval Scandinavia. G.S. Kealey, ed. — My Life as a Newfoundland Union Organizer: The Memoirs of Cyril W. Strong, 1912-1987. 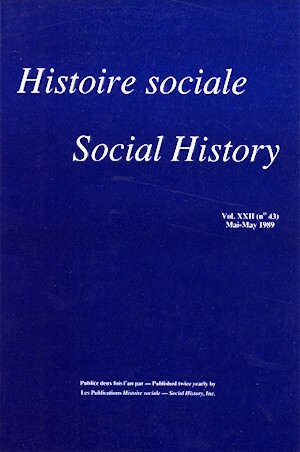 Bibliographie internationale d'histoire militaire sélection 1984-1987, vol. 9 (1988). Jan Goldstein — Console and Classify: The French Psychiatric Profession in the Nineteenth Century. Michael P. Fitzsimmons — The Parisian Order of the Barrister and the French Revolution. Joseph Bergin — Cardinal de La Rochefoucauld: Leadership and Reform in the French Church. Noël Coulet — Aix-en-Provence. Espace et relations d'une capitale (milieu du XIVe-milieu du XVe siècle). Jonathan Dewald—Pont-St-Pierre 1398-1789: Lordship, Community, and Capitalism in Early Modern France. Richard J. Evans, ed. — The German Underworld: Deviants and Outcasts in German History. Robert S. Wilson, ed.—An Abiding Conviction: Maritime Baptists and Their World. Desmond Morton and Glenn Wright — Winning the Second Battle: Canadian Veterans and the Return to Civilian Life, 1915-1930. Dian H. Murray — Pirates of the South China Coast, 1790-1810. Richard A. Lebrun — Joseph de Maistre: An Intellectual Militant. Peter Baskerville — The Bank of Upper Canada. Jean de Bonville — La presse québécoise de 1884 à 1914. Genèse d'un média de masse. Eric W. Sager — Seafaring Labour: The Merchant Marine of Atlantic Canada, 1820-1914. James T. Angus — A Respectable Ditch. A History of the Trent-Severn Waterway, 1833-1920. Mary M. Schweitzer — Custom and Contract: Household, Government, and the Economy in Colonial Pennsylvania. Doreen Evenden Nagy — Popular Medicine in Seventeenth-Century England.